This time is different from 1995, thanks to new media and the post-9/11 security environment. But there are surprising similarities, too. Christopher Cox decided the nation's capital was looking ratty and he was going to do something about it. 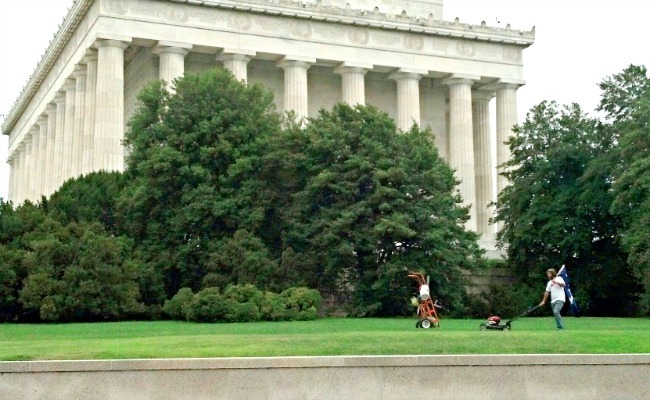 On Wednesday, the chain-saw sculptor from South Carolina planted himself on a patch of thick lawn abutting the Lincoln Memorial and started to cut the overgrown grass with a gas-powered mower. A passerby took his picture and tweeted it out. It quickly went viral. The Weekly Standard—whose Jonathan Last editorialized in a cover story that "the conduct of the National Park Service over the last week might be the biggest scandal of the Obama administration"—covered it on the magazine's website, where Jim Swift reported that Park Police officers asked Cox to stop his act of civic-minded volunteerism. Others, such as the The Kansas City Star, picked up the story online. The local Washington CBS News affiliate did a post, interviewing Cox. Columnist Michael Barone at the Washington Examiner blogged about him, calling the fact that a South Carolinian was mowing the Lincoln Memorial grass a sign the Civil War was well and truly over. The incident encapsulates how National Park Service closures have become the most visible face of the shutdown, now in its second week. Members of Congress who backed the government shutdown and fiercely oppose Obamacare and the president flocked to the World War II Memorial to chastise park rangers and stand with elderly veterans who feared being shut out of planned visits to the site on the National Mall, prompting NPS spokeswoman Carol Johnson to eventually offer a First Amendment-based reason to give the veterans access despite the shutdown. Conservative media began to catalogue what National Review called acts of "Vindictive Shutdown Theater" involving the Park Service; others dubbed the White House the "spite house" (actually the name of a tiny historic home in Alexandria) and cheered on acts of rebellion by restaurateurs and tourists who defied the shutdown orders. County officials in Utah threatened "civil disobedience" and removal of shutdown orders at a natural outdoor national monument, while governors in states with substantial federal lands pleaded—successfully, in the end—to be allowed to use state funds to keep national parks open and their local economies from crumbling. The clashes set law and values against each other: Non-furloughed parks staffers struggled to balance common-sense impulses with orders to enforce the shutdown of beloved public spaces. Legal strictures preventing volunteers from covering for regular employees during a shutdown clashed with Americans' patriotic instinct to chip in in times of need. The Office of Management and Budget's guidance to appropriations-funded federal agencies to cease all activities, with exceptions for security and other essential functions, flummoxed citizens who see federal parks as their land. And all the while conservative online outlets have sought to whip up sentiment against the government for taking steps dictated by the shutdown order. And yet what's been happening around the country is not wholly unprecedented. It's just very well documented. And, from the park service side, it's been better organized than during the only other mass closure —precisely because it is not unprecedented. When a government shutdown closed the national parks in 1995, it was the first time every park had been simultaneously closed in the National Park Service's then-79-year history. Press reports from that time detail closures that were done haphazardly, because NPS officials didn't know how long the shutdown would last or what guidance to provide to people staying in the parks or running private businesses within them about when they might have to pack up. (This lack of guidance later became the subject of complaints at a congressional hearing.) In many cases, local officials used their discretion, leading to differences in how firmly parks were closed: Some were gated shut. Some merely saw ranger stations abandoned. Some campgrounds were shut down, others left open. At the time, online media was in its infancy and the contemporary partisan press did not exist. The Washington Post would not launch its website until six months after the shutdown ended; The Weekly Standard debuted nine months after the government reopened. Taking pictures was something you did with film. There was no easy way to share videos without a physical exchange of tapes. While regional newspapers were in their heyday, most had no websites and no circulation outside discrete physical communities. Many did not feed their stories into Nexis, then the major database for searching for reports. Yet a close reading of reports on Nexis show many of the same conflicts playing out in nearly the same manner then as today—and, in some cases, over the fate of exactly the same private-sector inns and concessionary outlets. The Pisgah Inn on the Blue Ridge Parkway in North Carolina, for example, was shut down in 1995 and again in 2013, complaining loudly both times. Concessionaires at the bottom of the Grand Canyon suffered terribly during the first 1995 shutdown, just as they are in this most recent one. Conflicts between President Clinton and House Republicans led by Newt Gingrich actually caused two different shutdowns in 1995 and 1996. The first, from November 14 to 19, was resolved with a temporary spending bill. The second, from December 16 through January 6, ended when Clinton signed a budget that reopened the government. No one knew at the start of the first shutdown how long it would last, and news reports from the time indicate many observers thought it might not last more than a few days. They weren't far off; it lasted for five. Hopes for a quick resolution meant the NPS was reluctant to uproot campers and close private businesses on park lands unnecessarily, creating an environment of wait-and-see leniency at the outset. This time around, agency personnel set policies at the outset in anticipation of protracted closures—and appear to have strictly enforced them at the outset, becoming more lenient over time. Citing the law, the park service refused volunteer assistance in 1995. In mid-November 1995, it rejected Arizona Governor Fife Symington's offer to have the state's National Guard staff the Grand Canyon, turning away troops in Humvees and state workers, according to reports in the San Francisco Chronicle and New York Times. This year, the federal government has rejected an offer from Arizona Governor Jan Brewer, who also hoped to use state funds to keep the economically important natural wonder open to tourists. Offers by the Republican National Committee to pay for the costs of keeping the World War II Memorial open and by South Dakota to keep Mount Rushmore open using state employees were similarly rebuffed. 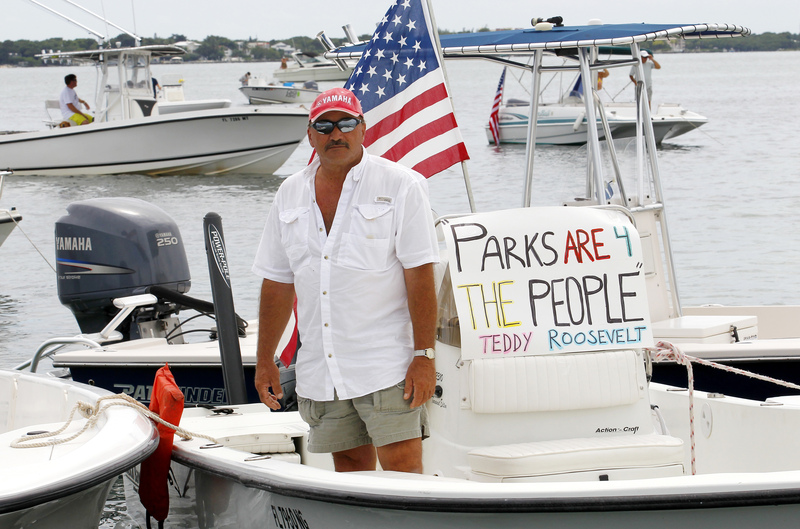 Private-sector concessionaires and nonprofits entangled with the national parks were shut down or kicked out of the spaces where they regularly volunteered or operated during the 1995 shutdowns. The World War II Liberty Ship Jeremiah O'Brien in San Francisco, operated by a non-profit and staffed by volunteers, had to shut down because it was covered by federal workers' compensation insurance, according to the Chronicle. The Golden Gate Park Association had to withdraw volunteers from the park when the areas they worked were closed to non-essential staff and volunteers. ''We cannot accept volunteer work, as it amounts to incurring an obligation on a government program,'' National Park Service spokesman Steve Crabtree said on November 18, 1995. During the second shutdown, some exceptions got worked out. The South Rim of the Grand Canyon and Carlsbad Caverns National Park stayed open after Arizona and New Mexico reached agreements with the park service in 1995. So, weirdly, did a single hunting area on federal land in Arkansas. After 10 days of park closures this October, the Interior Department announced it was changing course. "Responding to the economic impacts that the park closures are having on many communities and local businesses, Secretary [Sally] Jewell will consider agreements with Governors who indicate an interest and ability to fully fund National Park Service personnel to re-open national parks in their states," spokesman Blake Androff said in a statement. And the private Pisgah Inn, which sits on federal land in a government-owned building, was allowed to reopen this October after protests from the Asheville Tea Party group and a threat of legal action from manager Bruce O'Connell. In 1995, O'Connell testified before a House subcommittee on behalf of the National Park Hospitality Association, which represents the private concessionaires who work inside the park system. O'Connell called for a more orderly system of shutting such outlets down and expressed "shock" after the parks service told him "a federal marshall would be sent to ensure my compliance"—a threat similar to others reported by people arguing with park service closures 17 years later. The 1995-96 shutdown saw conflicts that resulted in legal action or threats of it, as well. In early January 1996, county officials in Brewster, Texas, sued the NPS over a road closure inside Big Bend National Park, according to The Houston Chronicle, accusing the feds of creating a public-safety threat and economic burden. As with the current closures, the closures in 1995 and 1996 went far beyond just the park service to encompass a broad array of federal lands. All of the 507 wildlife refuges operated by the U.S. Fish and Wildlife Service—save the one in Arkansas—were closed. The Audubon Society's Christmas Bird Count was curtailed, and some 45,000 hunters were turned away from federal lands, the park service reported in a notice. Even "traditional winter sleigh rides, operated by a private vendor, have been suspended" at the National Elk Refuge in Jackson, Wyoming, according to the detailed accounting of the impact of the closures. Notices from utility companies started piling up at offices run by the Bureau of Indian Affairs, which could no longer pay its bills. Representatives and senators from states like Alaska that contain vast swaths of federal land proposed that they receive a legislative out. But a bill considered to direct "the Secretary of the Interior to accept from any State donations of qualified State employee services to perform in a unit of the National Wildlife Refuge System or the National Park System, in a period of Government budgetary shutdown, functions otherwise authorized to be performed by Department of the Interior personnel" failed in the Gingrich-led House. 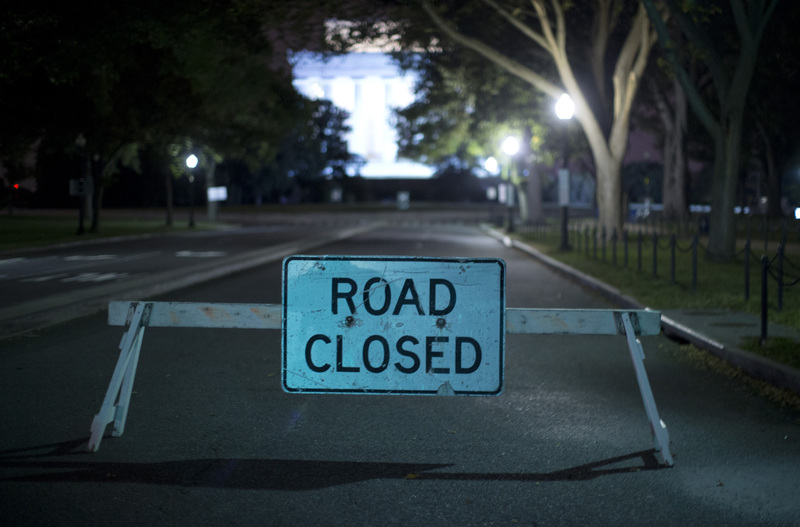 In Washington, most of the parks-system drama during the 2013 shutdown has centered on closures on the National Mall, which is a single national park stretching through the middle of federal Washington that includes a slew of monuments. 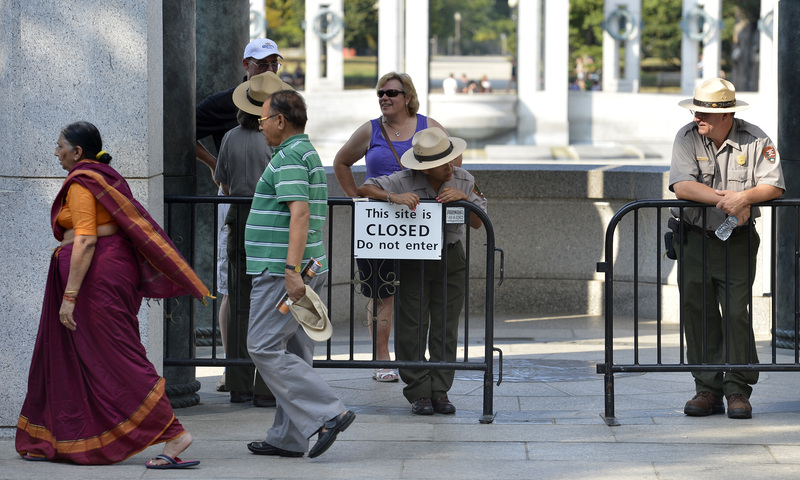 Controversy erupted over the closure of the monuments as soon as the shutdown began, when the open-air World War II Memorial, which is normally open to visitors 24/7 and staffed only part of that time, was fenced off just before a group of World War II veterans arrived from Mississippi. The next day, veterans with pre-existing plans to visit continued to arrive, and the tension soon spilled over to encompass visitors to the Vietnam Veterans Memorial. That outdoor wall also was fenced off, and on October 4 guards sought to disperse crowds that ignored the bicycle-rack fences intended to keep them out. Nothing like this happened during the 1995-96 shutdowns. Reports make it clear that many—though not all—of the memorials were shut down, but they did not become focal points for political activity. One reason is that the parks shutdown this time has been a much more thorough affair, reflecting the upsurge in security materiel available to NPS staffers since September 11, according to Interior officials. This time, fences were placed around all the memorials, not just the big ones with stairs. Another factor is the season: early October, when D.C. is still full of tourists, rather than November and late December, when the city empties out and people travel to spend time with their families, not a bunch of memorials. There's been some debate over what exactly happened during the 1995 shutdown. A review of every Nexis story that mentions the leading monuments shows that pass-by sites like the Korean and Vietnam War Memorials were not gated back then, while ones that had stairs were. the Lincoln Memorial was ringed with white barricades reading 'Area Closed.' A busload of Japanese tourists leaned their umbrellas into the cold rain and posed for photos by the sawhorses as Park Ranger Linda Bennett, 34, kept a lonely vigil. "I guess it's kind of an honor to be deemed essential," she said. "But right now, sitting in front of the TV at home sounds pretty good." Though tours of the monuments were canceled, some tourists wandered by for a quick look anyway. Others, who hadn't gotten word of the shutdown, were confused. Hans and Betina Pirchir, two bankers visiting from Austria, stood in the cold rain in front of the shuttered Washington Monument yesterday and asked, "Where are all the people?" An Associated Press report from the first day of the shutdown said "tourists were free to … touch the walls of the Vietnam Memorial and climb the steps of the Lincoln Memorial to read the Gettysburg Address." But three days in, the Miami Herald reported the Lincoln Memorial was "locked up." On January 6, the Associated Press reported, "The National Park Service reopened the Washington Monument, Lincoln Memorial and other sites Saturday morning, with the Smithsonian and other museums following at noon"—indicating the Lincoln Memorial was at some point formally closed. To the extent that it remained accessible, it was because people ignored the temporary fencing then, just as they are ignoring it now. The big controversy in 1995 wasn't in Washington but in the southwest, with the closure of the Grand Canyon—the first since it opened as a national park in 1919. It makes sense: The World War II Memorial is an open-air, manmade creation that people can visit at night, but the Grand Canyon is an open-air act of God and time, described by Theodore Roosevelt in 1903 as "beyond comparison—beyond description; absolutely unparalleled throughout the wide world." How could the government close this gaping chasm in the earth it had promised to hold in trust for the people? The thoroughness of the closures this year makes sense only if you're banking on a long shutdown. Trash doesn't pile up overnight. And while on the first and second days of a shutdown it can seem idiotic to have cordoned off a playground at a federally run neighborhood park on Capitol Hill, by week three such a barrier will be a necessary legal warning that if you go in anyway and your toddler cuts herself on broken glass and that stayed there because no one is cleaning the place—well, that's on you, not the government. "Without staff or funding to ensure the safety of visitors, the security of the memorials, and the continued operation and maintenance of park facilities, the memorials on the National Mall—just like Yellowstone and the Grand Canyon—are closed," Johnson, the NPS spokeswoman, said in a statement. Cordoning spaces off or hanging signs in front of them even if they cannot be securely closed is a legal strategy for preemptively dealing with the things that can go wrong in abandoned spaces, and serves notice that if a site looks bad it's because of the shutdown, not willful neglect. D.C. has a terrible record of under-maintained public parks turning into disturbing hangouts for criminal activity, not to mention locales for trash-pileups and cozy vermin homes. In a shutdown of a couple of days, that's not much of a worry. But if could become more of one if the shutdown extends into November. (See my 2002 Washington City Paper piece, "Parks and Wrecks," if you want to a sense of what a public-safety disaster bad parks policy once created inside the District.) One week in, Mayor Vincent Gray announced the city would begin emptying trash cans in federally owned neighborhood parks that are easily accessible to city trash collectors, in a bid to prevent an increase in vermin citywide. Already, there are signs of decay. C-SPAN's Howard Mortman tweeted on Wednesday morning: "#shutdown-related? Spotted 2 rotting roadkill deer carcasses southbound GW Pkwy this morning (below 123). GW Pky is a natl park @wtoptraffic." On his way home, he counted three carcasses. That gets to how the radically different media environment makes the current moment so very different from 1995. During the Clinton Administration, if you saw two animal carcasses on the side of the George Washington Parkway on your drive to work, you told your coworkers instead of tweeting it to the whole world in near-real time. Everything now is more documented, more likely to become a story. That's how a short dispute over the placement of barriers on a tour-bus turnaround became a multiday story in online media, fueled by and fueling conservative outrage. On the morning of October 1, NPS staffers barricaded parking lots along the GW Parkway, including a lot and turnaround at Mount Vernon, the first president's historic estate. The park service regulates the spaces, but the Mount Vernon Ladies Association actually owns the land and manages the estate. By Tuesday afternoon, after some back and forth between the NPS and the association, the spaces were back in service. It's hard to imagine such a brief disagreement over the placement of barriers on a parking lot becoming synecdoche for the president himself 17 years ago—one conservative columnist cited the kerfuffle in calling him "a sadist-in-chief who abuses the American people purely for partisan gain"—or that anyone would even have heard about it. The same goes for many of the problems at Yellowstone National Park. They might have been covered, but it would all have happened differently. The Eagle Tribune that covered some of the early shutdown scuffles this month at America's first designated national park would not have been something reporters in Washington could have read in real time 17 years ago; there was just no way to get information back East about what was happening on the ground except through files from national or wire-service reporters stationed out there, regional TV affiliates, or day-late deliveries of the larger regional newspapers. But now we can hear about every single thing that goes wrong, in real time, from the people involved. The NPS quickly found an out to the World War II Memorial snafu in a 2010 legal decision against the park service, which found that the First Amendment protected free-speech rights in the parts of parks that serve as public forums, and decided to use that to allow the veterans to continue their visits. There's a formal "free-speech zone" inside the memorial, as well as a number of others throughout the National Mall, though Interior Department spokespeople declined to say how many or where they are located. "The Honor Flights are being granted access to the WWII memorial to conduct First Amendment activities in accordance with National Park Service regulations applicable to the National Mall and Memorial Parks," Johnson said. Others also have taken advantage of the provision, from immigration reform advocates to veterans' groups, who plan to descend on the mall this Sunday for the "Million Vet March on the Memorials," sponsored by a coalition of Tea Party and libertarian groups. Meanwhile, each day yellow caution tapes and barricades are pushed aside as Americans decide they're happy to risk getting snapped at for a moment in order to look at what they came to see.